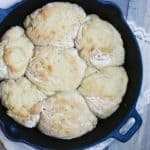 These flavorful and moist biscuits are the perfect combo for a cold night when paired with a warm chili or soup. Add 1 cup of beer to a large bowl and heat for 30 seconds in the microwave. Remove and let sit 1 minutes. Whisk in yeast and let sit 5 minutes. Slowly add in 2 cups of bread flour, mixing with a wooden spoon. Add in onion powder and dried minced onion. Continue to stir, adding in remaining 1 cup of bread flour. Divide dough into 6 to 12 dough balls. Lightly coat cast iron skillet with oil and set the balls in. Cover and set in warm place for at least 30 minutes. Preheat oven to 400*F 10 minutes before the 30 minute rising period is done. Before setting into the oven, lightly brush tops of biscuits with margarine/butter and place in oven. Bake. Remove and let cool when top is slightly brown. Store in an airtight container for up to 3 to 5 days for optimum freshness. An average refrigerated biscuit has over 170 calories and 6 grams of fat, some of which comes from the dreaded TRANS FAT! Stay clear of the hydrogenated oils and opt for a homemade version instead, your heart will thank you!